Unlike County Leaf & Limb Pick-up – the cost of which is included in your property taxes – trash collection must be contracted separately by each homeowner with a private service provider. Currently, Kingswood residents use a variety of services, each with a different pick-up day. As a result, we have trash cans on our curbs and loud sanitation trucks on our streets many days of the week. If we are able to get together and agree to use one quality service, we can minimize garbage truck traffic, reduce unsightly garbage cans on our streets, and help each other save money on these services as well. As a result of past efforts recommending using one primary service provider, over 25% of our households now use Curbside Services of Bogart – a local family-owned business – and receive a monthly discount. We can enjoy an additional discount once we reach 50% participation; so, when selecting or upgrading your trash service, please consider using Curbside. Ask anyone who uses them about their satisfaction. They have proven to be helpful, courteous, reliable, cost-effective, and conscientious about picking up anything that falls to the ground, thus keeping our landscapes cleaner. In addition, Curbside accepts mixed recycling – so you don’t have to sort cans, bottles, etc. 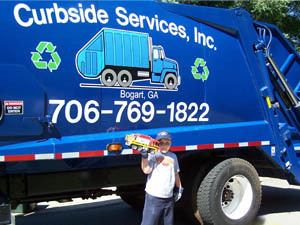 And, if taking your trash to the street and retrieving your emptied containers is a burden to your health or schedule (or, if you just want to keep your curb looking neat) Curbside also offers back-door service for a nominal fee; so you won’t even need to remember that it’s trash day. Curbside also offers garden tilling, bush hogging, junk removal, tractor work, and lawn clean-up services.